Former Cabaret Voltaire multi-instrumentalist Richard H Kirk has long been a scathing political voice - one of the factors that meant that band had more in common with industrial contemporaries such as Throbbing Gristle or 23 Skidoo than any of the Duran Durans and Blancmanges they were sometimes compared to. Since Cabaret Voltaire dissolved, Kirk has continued to fashion a danceable yet oppressively dark musical language. Whether reflecting the decline of hometown Sheffield’s industrial past or barking angrily at demagogues and despots the world over, Kirk’s voice, especially his solo output, is one of agitation and resistance. So it’s no surprise that Dasein, his first full album in over a decade, is a howling echo of the troubled state of the world. 'Dasein' is a German word which roughly translates as 'existence' and, as simple as it might sound, this is an album that feels very present. It weighs heavily with portent and straddles a number of styles and musical strands. Each track bar one breaks the 10-minute mark, with a couple edging towards 20. Kirk sings throughout, which is novel, but his voice is more often than not swallowed into a vortex of dense, frenetic and flowing sound in which rhythm and melody hurtle forwards at breakneck speed, the various textures surging and dissolving in and out of a seething whirlpool. Even the somewhat jaunty (at least comparatively) ‘Do it Right Now’ is based on an uneasy swirl of synths, with Kirk’s dislocated vocals and metronomic beats reminiscent of the best motorik krautrock such as Neu! or Harmonia. Coming at the midpoint of the album, ‘Do it Right Now’ can be seen as a calm break between two suites of unwavering aggression. Opener ‘Lets Jack’ is driven by jackbooted bass-drum kicks and the kind of warped wah-wah guitar that Kirk deployed so effectively on Cabs songs like ‘The Set Up’ and ‘No Escape’. Again, his mutated singing is buried deep beneath a cosmos of glimmering synths, bursts of white noise and the aforementioned guitar, but the ever-present rhythmic shuffle also reminds listeners of Kirk’s role in the crystallisation of rave music and UK house. ‘Lear Jet’ is similarly forceful and rhythmic, its pounding percussive loops a slowed-down echo of Cabaret Voltaire’s Three Mantras EP. Kirk’s voice betrays emotion on 'Lear Jet' as it moans like the ghost of Alan Vega trapped in a wind tunnel. ‘Nuclear Cloud’ emerges on a bed of oscillating synths like the opening to a Dopplereffekt album (again a sign that Kirk’s emergence in electronic music goes beyond the industrial, synth-pop and rave genres he’s most readily associated with) before a burst of noise signals a shift in gear and the arrival of taut snare snaps and hi-hat rattles. The effect is disorientating but beautiful, the house percussion adding a sensuality that juxtaposes acutely with the more brittle and glacial sonics around it. Track titles like ‘Nuclear Cloud’, ‘Lear Jet’, ‘New Lucifer/The Truth is Bad’ (now I wonder who that could be aimed at? ), ‘Radioactive Water’ and ‘Invasion Pretext’ make clear Kirk’s political angst. As tensions ratchet up between the west and an apparently nuclear North Korea, as war continues in the Middle East and Theresa May and Donald Trump sit down with the dictators in Saudi Arabia, it’s hard not to see large sections of Dasein as a soundtrack to a nightmare collage of news feeds from the last few years - and from the dread upcoming future. 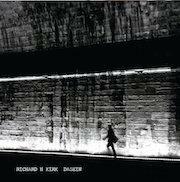 Dasein may be the most ambitious and complex album Richard H Kirk has created in his solo career, at least since 1983’s essential Time-High Fiction. Given that it and his other early solo records have recently been reissued in a lush box set to remind us of his unique approach to electronic music, Dasein doesn’t just feel important in its starkness and bleakness, but as the work of an artist who isn’t done exploring in inventive and exciting ways.